As mentioned in previous blogs, Perfect World International has been working on a new expansion called Genesis, which just went live last week on March 1st. After checking out the game with the new expansion, here is a more in depth guide of the new features available in Perfect World: Genesis. One of the main features is the introduction of a new race, the Earthguard. They have a “Third Eye” and are very in touch with nature. They have their own brand new starting location and city. Their flying mount are kites that carry them in the air. Like the other races, they have two classes. The Seeker is a armored melee character with a large two handed claymore and the ability to put out good AoE damage and debuffs. The Mystic is a magic based character that can heal, damage, and summon pets. Another huge change in gameplay relates to Territory Wars. Not only will there be new additional territories for players to conquer, there will be a map reset where all the territories will go back to being unclaimed. This is big as most maps are currently held by only one guild and it represents a chance for other guilds to enjoy more wars again. Another feature for guilds is the introduction of guild bases. 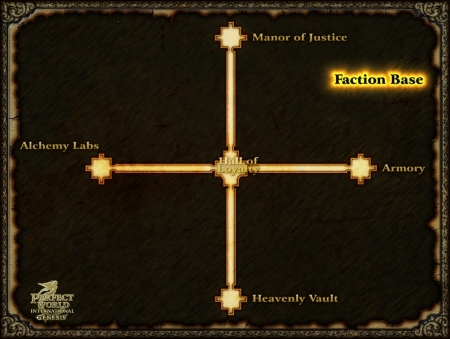 You will obtain your own instanced area where you can hang out with other guildies and complete different quests and obtain materials to upgrade the four parts of your base: the Armory which holds faction-specific gear, the Alchemy Lab where you get access to powerful 1 hour buffs, the Manor of Justice where you can get quests to increase your Contribution, and the Heavenly Vault where you turn in guild materials. This will add another level of integration where guild mates will be able to help each other complete quests to build up their base. PW: Genesis also offers a new crafting skill called Runecrafting. While this skill will be harder to obtain and require multiple quests that will be made easier with help, it also offers strong rewards as a rune can be used to add stats to a weapon for a limited time. While lower levels of Runecrafting will have regular stats like str and agi, higher levels of Runecrafters will be able to craft runes that will increase crit% and atk/def levels. These buffs lasts 30 or 60 min and could be important in large battles. While many of these additions will be for more endgame players, the addition of the new race may be something for new players to check out to see if they like them. Both classes are new player friendly and may be easier to play than some of the more group based classes. It is still too early to tell how these classes will fair end game but at least they look pretty cool anyways. One comment so far, why not make it two? I play this pwi and I love it.There are alot of classes to pick from.You just have to try and graphics are hard to top.